i'll start this post by breathing an enormous sigh of relief. i have officially completed my year of teaching. praise the lord! it was a huge challenge that i am glad to have behind me. i learned a LOT from this year in korea, but close to the top of that list is "i was never meant to be a teacher." i managed, but if given the option, i would never again choose this path. hats off to all of you educators of the world -- your job is NOT easy & (most of) you are definitely not paid enough. i'll now make my humble exit & go use my business degree to crunch some numbers. or answer some phones. or something. with the completion of the day friday, i ended my teaching career & began the countdown to my return to the states on february 7th. just one short month away. i can't believe it! sadly, the goodbyes have already begun. 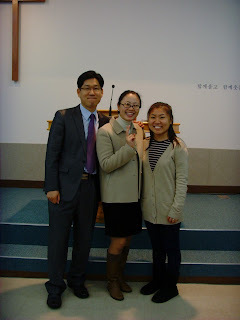 last week, i attended my last sunday of korean church. pastor jo & his wife, eun-sol, took care of me as one of their own. as if pastors don't have enough on their plate, during this year, he was taking higher education classes and they were together raising their 2 young boys & shepherding their ever-growing congregation. these 2 taught me true hospitality. i anxiously await the day when we will reunite. sweet, sweet ms. seoh was my faithful chauffeur. every week, she'd pick me up & drop me off at knu...and sometimes even drive me all the way home to my apartment - a long haul. those rides together gave us both opportunity to practice our 2nd languages. i will miss her dearly. david & hye-won are my heroes. seriously. they would translate the sermon for me every week so i had some clue of what was going on around me. a huge time commitment on top of taking care of their precious newborn, beth. i couldn't have survived this year without them. in addition, david's korean is ridiculously wonderful & hye-won's english is equally as mind-blowing. as i mentioned, they're my heroes. the next 2 weeks will see lots of sleep, some knitting, some LOST, (hopefully) lots of korean study, and lots of time with friends. after that, my little brother will return to korea from his university in china and i will move to seoul to live at my family's house until i fly out on feb. 7th. i already know that the time will pass all too quickly. this week, i had a conversation with my dearest korean friend su-in that really stuck with me. first, a little "background" info. english in korea is not english as you know it in america. maybe 5% of the country can speak in full, proper english sentences. (exaggerated statistic) communication is incredibly difficult. coming to korea, i was bright-eyed and bushy-tailed thinking...i don't know what...maybe that i would somehow magically educate the entire country & they would all speak perfect conversational english by the time i left at the end of the year. it took about 2 days in korea for me to be knocked off that high-horse and slapped back to reality. since then, my english has been in rapid decline. sometimes i will try to say something totally commonplace and 100% forget the word. or even worse, i'll forget the english word, and only know how to say it in korean. i'm not kidding you. if for no other reason, i need to head back to america to re-learn english. there are many english phrases that koreans know & use without knowing synonyms for that word or phrase. therefore, i have also dismissed those synonyms from my vocabulary. for instance, koreans ALWAYS say "take a rest." if you say - "i'm tired. i need a nap" or "i want to snooze" they look at you like you're speaking some tribal african language. another example, as you might have noticed above - you don't attend "college," but "university." in addition, korean language structure & english language structure are very, very different. in korean, the verb comes at the end of the sentence. therefore, i sometimes find myself speaking english with the korean language structure. seriously. "i'll go to the store tomorrow??" no way! "tomorrow me store go." oh, i have also completely eliminated articles & other short, "unnecessary" words from my vocabulary. i'm telling you folks -- english teacher of the year right here. so back to the conversation. su-in & i were eating & chatting and she said "i have an english question." since she is an english genius and this rarely happens, i sat up straight & asked what i could help with. she said "earlier, you said something about '2 days before' but is that different from '2 days ago'?" busted. you know konglish has officially gotten the best of you when koreans are correcting your english. i hung my head & told her - "just ignore that. '2 days ago' is much more natural. you're right." we then started talking about how incorrectly i speak around koreans & i realized that somewhere along the way i evolved from that bright-eyed bushy-tailed world-changer to bumbling, stupid ignoramus. what happened?! my theory is that, quite honestly, i quickly realized that speaking correctly was not an efficient form of communication. seriously. speaking perfect english gets you nowhere in korea. they won't understand. therefore, i learned to adapt and speak only necessary words in a sentence pattern more familiar to korean brains. this only worsened after i met my korean family. on nights & weekends, i wasn't whitney teacher. that was just my mon-fri, 9-5 face. 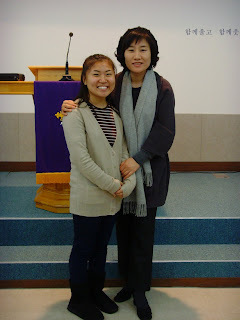 after that, i was a pitiful foreigner trying to fumble my way through life in korea...or the reunited korean adoptee trying desperately to form connections with her birth family. at first english was the sole means for coming to korea. afterwards, it became merely the tool i modified for survival. my goal is no longer to teach, but rather, to be understood. i've come to care much less about HOW i communicate. instead i am trying my best to simply getting the point of the message across. even this is often much more difficult than you could imagine. so this brings us to the question -- am i right or wrong? i was hired to come to korea to teach english. of course, in the classroom & around the workplace, i was always careful to speak perfectly. but after i took off my teaching shoes, i switched into survival mode & became a completely different person. aren't the true teachers the ones who are always teaching? not just the 9-5, work-for-the-paycheck jerks? i was never meant to be a teacher. I think you are meant to be Whitney ... teacher, businessperson, or whatever. For a season, you have taught in a classroom, but it didn't end there. 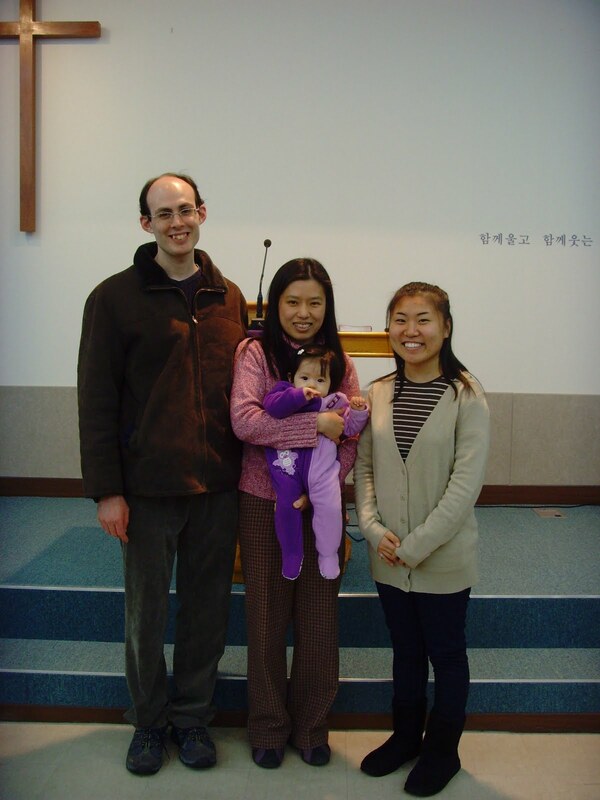 I suspect you've taught quite a great deal to your pastor, Ms. Seoh, David and Hye-Won, your Korean family, your American family, and everyone you've met. You ARE meant to teach, Whitney! You've taught your self a great deal too. In one year, you've learned more than many people attain in a lifetime. You've taught me a great deal. We all teach ... everyday, and you, my little friend, do a superb job at it.